Handmade rose quartz Chakra healing bracelet. Each bracelet contains 108 genuine crystals and has a stretch band that is approximately 27.5” around when not stretched. Comfortable to wear as a bracelet or necklace. Elastic band is durable enough for daily wear. Tree of life pendant and tassel. Amethyst, lapis lazuli, blue turquoise, green aventurine, tigers eye, orange carnelian quartz, and red onyx. Each of these bracelets have been handmade and sage blessed by a member of the Cheyenne River Sioux Tribe. Really love it. I can’t wrap it around my wrist 3 times, only 2 and it’s loose, but it’s good for meditation or wearing around the neck. Ohh, this is a gorgeous piece. The beads are a little bit smaller than my white howlite bracelet from here, but it's perfect to compensate for how long it is. It wraps perfectly around my wrist four times, and I can't stop staring at the crystals. I know Sheyenne picks her crystals out specially by hand, which I appreciate. 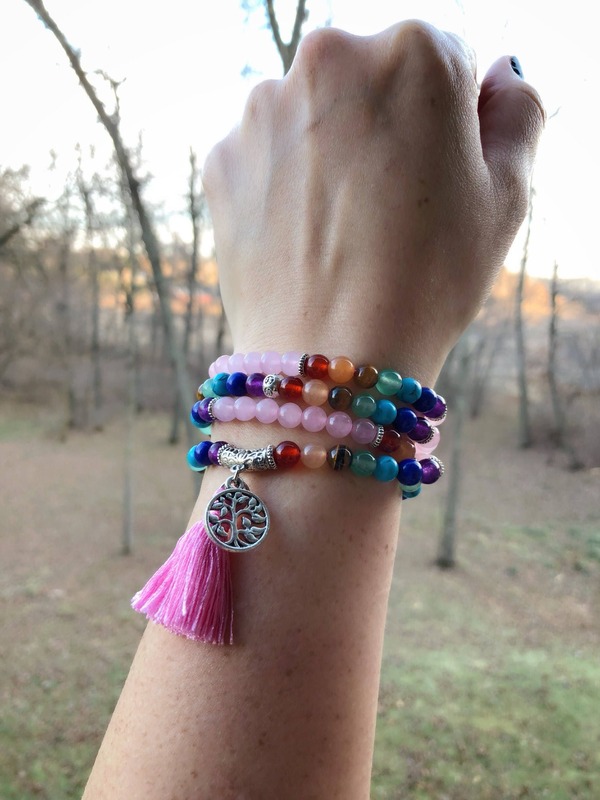 Rose quartz connects to the heart chakra and promotes love and healing, plus it's my favorite color. I'm really looking forward to wearing this, I feel like a princess.